We’d love your help. 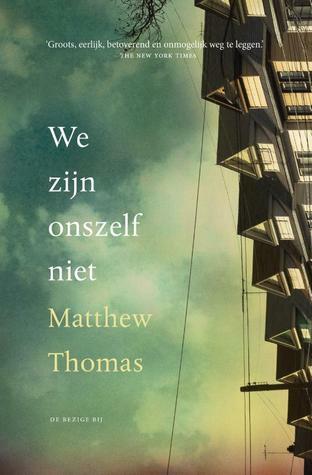 Let us know what’s wrong with this preview of We zijn onszelf niet by Matthew Thomas. Als enig kind van drankzuchtige Ierse immigranten droomt Eileen van een beter leven, ver van haar hardvochtige jeugd. Wanneer ze als jonge verpleegster Ed ontmoet, een talentvolle neurobioloog die in niets lijkt op de mannen die ze tot dan toe gekend heeft, verwacht Eileen dat hij haar het kosmopolitische bestaan zal geven waarnaar ze zo verlangt. Eenmaal getrouwd koestert Als enig kind van drankzuchtige Ierse immigranten droomt Eileen van een beter leven, ver van haar hardvochtige jeugd. Wanneer ze als jonge verpleegster Ed ontmoet, een talentvolle neurobioloog die in niets lijkt op de mannen die ze tot dan toe gekend heeft, verwacht Eileen dat hij haar het kosmopolitische bestaan zal geven waarnaar ze zo verlangt. Eenmaal getrouwd koestert Eileen grote ambities voor zichzelf en haar gezin, en moedigt ze Ed aan om steeds meer te willen: een belangrijkere baan, prominentere kennissen en een mooier huis in een betere buurt. Haar idealistische man geeft echter helemaal niet om status en geld en werkt categorisch tegen. Terwijl de jaren voorbijglijden wordt duidelijk dat Eds flegmatische houding en onmacht worden veroorzaakt door een neurologische aandoening. Als hij al op jonge leeftijd begint te dementeren, kapseist het gezin. Het leven van Ed wordt verwoest, en dat van Eileen en zoon Connell ernstig ontregeld. To ask other readers questions about We zijn onszelf niet, please sign up. I am on page 270...there are 648 pages.........I'm stuck.. I'm not liking it.. its boring ......and too wordy......should I stick with it.......? the first 100 pages I was hooked but now I'm struggling. Anyone know where to get a cheap copy of We Are Not Ourselves? I wanna read it so bad but every copy I've seen is around 20 bucks and I'm a broke high schooler!!! It was a bit hard for me to rate this review with stars. There were times that I thought that I was going to give it 3 and other times 5 stars, so I've settled in the middle of the two. Instead of being plot-driven this book seems to be solely character-driven where you get a feel of the families individual idiosyncrasies and if you pay particular attention to detail, you can see how the twists and turns in their lives cause subtle changes in each character as you would in real life. This story i It was a bit hard for me to rate this review with stars. There were times that I thought that I was going to give it 3 and other times 5 stars, so I've settled in the middle of the two. Instead of being plot-driven this book seems to be solely character-driven where you get a feel of the families individual idiosyncrasies and if you pay particular attention to detail, you can see how the twists and turns in their lives cause subtle changes in each character as you would in real life. This story is best summed up as being centered around one family, mostly following the mother Eileen, and their ups and downs throughout life. Although I would have to say that it was mostly downs than ups. Eileen wants to live a life of prestige. She not only graduated from high school but received a BS in Nursing as well as a Masters in Nursing Administration. At some point she finally meets a man that she deems worthy enough for her, after giving up the dream that some wealthy man would sweep her off her feet and allow her to live off of his wealth. And when life sets in and things start to move off-track, Eileen chooses to overlook them as if they weren't happening because in her mind her life was going to be projected the way she wanted her life to actually be. Eileen and her husband, Ed, eventually have a child and name him Connell. Luckily for Connell his dad seems to be great at giving him emotional support. Growing up Eileen's mother was very distant and as a result, Eileen is hard and off-putting almost as though she were narcissistic, but I am not sure that she could be labeled as so. It seemed that her image would shift from indifferent to cruel to passive and then controlling. I couldn't quite figure her out, but I felt sorry for her son because she treated him horribly at times. I think deep down though that she loved him the best way that she knew how. Because this story is mainly character-driven, it is long and at times slow moving. I think this would be the only reason why I didn't take the plunge and give it five stars. I think as much could have been achieved with developing the characters in the story had it been tightened down to at least 100 less pages, but this is my personal opinion. The author did an excellent job with making the characters three dimensional because I found myself getting angry and frustrated at the mother when she would act so indifferent to her son or controlling toward her environment and at other times when she was so oblivious and chose to see things not as they really were. At times it was painful to read these parts because as the book progressed I began to loathe her. She reminded me a lot of the mother from the movie/book 'Ordinary People', Beth Jarrett, because she was wound so tight and was so concerned with outside appearances than to open her eyes and look at her life as it really was. At first I thought that the book failed by making the MC so dislikable, but the more I thought about it afterward, I realized that the character of Eileen was so well developed that she pulled some serious emotion from me. If you are looking for a great character-driven novel then this is definitely the book for you. The word I keep coming back to with this book is "honest." No punches pulled here. These characters might let you down, they might not do what you want them to do in every instance, but damn if they don't feel real throughout. Still, the second half of this book is an epic, gut-punch of a page-turner. Highly recommended. I wish I was a professional writer or reviewer so I could give this novel the brilliant review it deserves. But, alas, I am just a reader who is still processing and recovering from the last highly emotional pages of it. This is about as perfectly written as a novel can be. Eileen Tumulty is born to Irish immigrants in Queens, New York. Her childhood was tumultuous, and she was forced to grow up sooner than most girls her age. She knew early on that she wanted more of a life for herself. She tho I wish I was a professional writer or reviewer so I could give this novel the brilliant review it deserves. But, alas, I am just a reader who is still processing and recovering from the last highly emotional pages of it. This is about as perfectly written as a novel can be. Eileen Tumulty is born to Irish immigrants in Queens, New York. Her childhood was tumultuous, and she was forced to grow up sooner than most girls her age. She knew early on that she wanted more of a life for herself. She thought she had found it when she fell in love with and married Ed Leary, a loving and brilliant scientist, professor and truly decent man. No slouch herself, Eileen became a high-achieving nurse. Ed and Eileen went on to have a son, Connell, in whom they placed high expectations. Eileen's American Dream was shattered by events of which I won't speak for fear of ruining the story. I like to go into a book knowing as little as possible, and this story is a prime example of why I feel as I do. The story is so remarkable and emotional that it deserves to flow and gradually reveal itself to the reader. I loved Matthew Thomas's sparse writing style. I loved his evocative character studies. He seemed to write as if from a distance, but he knew his characters so intimately that I took them into my own heart. Even his minor characters were unique and memorable. I would be surprised if this novel doesn't earn all sorts of awards, and I think it will appeal to a wide spectrum of readers. It is such a perfect novel. Did not finish. Characters were flat and plot mundane. It was just unrelenting misery throughout the story - alcoholism, miscarriages, death, illness, bullying - and that was only the first quarter of the book! I know I am in the minority as most people loved this book - but I needed to see a glimmer of hope (or even a likeable character), and Matthew Thomas failed to deliver it. As bored with this book as Eileen was with her life. 100 pages in I figured something needed to change, and if it wasn't going to be her, it had to be me. This is an unblinkingly awful exploration of dementia, that’s what dominates three quarters of this very long novel. It’s a very stately, simple, no-flash account of an Irish American woman who meets a guy and has a son, that’s really it. Eileen is really not the nicest person, husband Ed is kind of strange and hugely dorky and the son Connell is frankly someone I would pay not to spend any time with, and this, of course, is the point. She is a senior nurse craving for upward mobility, he is a p This is an unblinkingly awful exploration of dementia, that’s what dominates three quarters of this very long novel. It’s a very stately, simple, no-flash account of an Irish American woman who meets a guy and has a son, that’s really it. Eileen is really not the nicest person, husband Ed is kind of strange and hugely dorky and the son Connell is frankly someone I would pay not to spend any time with, and this, of course, is the point. She is a senior nurse craving for upward mobility, he is a pharmaceutical researcher and college lecturer, you might think that they would be going places but he vetoes every plum job that’s dangled in front of him as he’s in love with the idea of being the chemical Dead Poets Society guy, you know, impressing tender minds with the inviolable truths of Western whatjamacallit. She wants to get out of the Jackson Heights neighborhood as it’s frankly going down, by which she means that the local skin colour is modulating in a brownish direction. So she surreptitiously buys a large house in Bronxville, which is so much better, meaning the neighbours are pleasantly white and you don’t have to ever talk to them. Meanwhile Connell is just your standard government issue teenage American jerk. When they move is when Ed gets the disastrous disease and from then on it’s all pretty much suffering. It's very compelling. It’s almost dull to begin with, but that’s okay. Everything, even the later horrors, moves at the same speed, which I think is around 19 miles per hour. It was an antidote to all the kinetic eyeball-wrenching modern movies I have seen recently. There were no jump cuts, no flashbacks, no postmodern party tricks. It was the sweet, sad music of humanity. I can't really believe this relates to THE Trump Family... but could there be another? And if it is one of THEM, why would they be borrowing books from Queens Library? 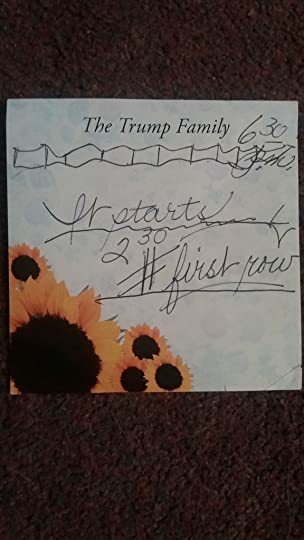 Or maybe the above notelet was given to a Trump family acquaintance who does use Queens Library? How can We Are Not Ourselves be a debut novel? If you had the opportunity to hear Matthew Thomas explain it, it would make sense. Ten years, yes ten years of hard work, tweaking and self- editing before he even tried to sell his manuscript. Ten years. Thomas' diligence paid off in a bidding war for his novel and with glowing early reviews from professionals and readers alike. It was enlightening to hear Matthew Thomas speak at R.J. Julia's in Madison, CT this past Monday evening. It also makes m How can We Are Not Ourselves be a debut novel? If you had the opportunity to hear Matthew Thomas explain it, it would make sense. Ten years, yes ten years of hard work, tweaking and self- editing before he even tried to sell his manuscript. Ten years. Thomas' diligence paid off in a bidding war for his novel and with glowing early reviews from professionals and readers alike. It was enlightening to hear Matthew Thomas speak at R.J. Julia's in Madison, CT this past Monday evening. It also makes my thoughts on We Are Not Ourselves harder to express. Not only did I really like We Are Not Ourselves but I liked Matthew also. These two things combined make we want to get this right but unlike Matthew I don't have ten years. Simply stated We Are Not Ourselves is an impelling saga of a multigenerational Irish family and their life in New York. Would this description alone make you want to read this? We Are Not Ourselves has beautiful language, a well-constructed plot, is atmospheric and has characters with great depth. What makes this one stand out in a crowd of good books and worth your time to commit its 600+ pages? For this reader it was the feelings it evoked. It is like watching ordinary people with ordinary dreams and passions, a window to their soul or self. Eileen Tumulty, daughter, wife, mother is at the center and the driving force of much of the novel. The author's thoughts on naming her were quite interesting but I leave you to your own conclusions. We meet Eileen as a young girl and it is here, like most of us, that her self is formed. She is the daughter of an alcoholic mother and a father who is like the mayor of the local pub. Early on Eileen becomes fixed in her caretaker role. These things should make Eileen a strong woman with the power to be whatever she wishes yet somehow she becomes a shadow of what?, circumstance?, choices?, leading to her own undoing. She wants, she yearns, she strives, and the quest is always just a bit beyond her reach. She is a sad rendering of a smart woman and it is hard for me to like her. Ed Leary, her husband became my focus. A man who is content to just be. A college professor who truly believes motivating and teaching his students is far more important than position or money. A man with a brilliant mind that is slowly falling apart. Clues are given, the thought of Alzheimer's is there but it is kick in the gut when it is confirmed. Connell, the offspring, their son. The relationship between Connell and his parents bears close attention. The father/son affinity is powerful and doubly sad in consideration of Ed's disease. Watching this sensitive boy dropped in the middle of this nest was painful. In the end I haven't disclosed much.We Are Not Ourselves is a book that needs to be digested in its own way by each reader. I do feel it is worth your time. Read a few reviews. Consider the subject matter. Enjoy. "If I could make days last forever / If words could make wishes come true / I'd save every day like a treasure and then / Again, I would spend them with you." An elegiac novel to a committed wife whose husband suffers early onset Alzheimer's. I found particularly moving her ability to adapt and accept and cope with the loss of her dreams of a husband who's a dashing, successful professor arriving each evening to a beautiful home in the perfect suburb, all transformed into a constant pain and loneliness as passion and all their past slowly falls away like sand through an hour glass. I just finished reading and reviewing a novel about home, identity, and how unexpected human developments/illness can capsize lives, called THE ARSONIST, by Sue Miller. And here are those themes again, but in a much different style, plot, and story. Thomas's debut novel is an epic saga, a tersely executed but moving tale of an Irish-American family, and spans a few generations, from the early 1950s to 2011. The story predominantly focuses on Eileen Tumulty, who is a first generation American, an I just finished reading and reviewing a novel about home, identity, and how unexpected human developments/illness can capsize lives, called THE ARSONIST, by Sue Miller. And here are those themes again, but in a much different style, plot, and story. Thomas's debut novel is an epic saga, a tersely executed but moving tale of an Irish-American family, and spans a few generations, from the early 1950s to 2011. The story predominantly focuses on Eileen Tumulty, who is a first generation American, and opens when she is just a child. However, it is her married adult life that is the heart of the novel. The story is both broad and specific. Thomas expands his lens to incorporate Eileen's life experiences growing up in New York, her hard-bitten childhood, especially dealing with her mother's alcoholism and her father's more veiled gambling problems. At the same time, we get a sense of each era that we pass through, but just enough to strengthen the story at hand. Too, as neighborhoods change or gentrify, we see how they evolve from what preceded them. The details of different suburbs in New York City make them come alive, both physically, socially, and emotionally--an analogy to how people evolve in families. Each generation leaves its fingerprint on the next one. Eileen, in her quest for self-improvement, and her status-conscious nature, is tenacious in her ambitions to climb the ladder of success, "the ineffable something she'd been chasing." Eileen loves to entertain, and to take pride in her home. Her husband, Ed Leary, a quirky academic/scientist, cares little for furnishings and material trappings. He cares about his work and his students, and playing baseball with their son, Connell. Ed has no aspirations to attain financial wealth, especially if it means sacrificing his principles and giving way to what he calls the decadence of capitalism and consumerism. It is all about the students to him. He has no interest in being an administrator, dean, or corporate executive, positions that were offered to him but that he turned down. Eileen was frustrated at his complacency; she yearned for Ed to aspire for more, specifically a climb to the top of the food chain. "She needed him to be her partner, because she loved him terribly...and so she was going to save him from himself...He needed a real home no less than she did. His mind had grown smaller as he'd bunkered himself in his ideals...He needed to regroup, to see new possibilities, to think bigger than ever. If there was anything she could help him with, it was thinking big." Life throws some curve balls at the Leary family, and what is most vivid about the book is the gravitas of Eileen, Ed, and Connell. Eileen is the polestar of the family, and I deeply felt every twist and turn in her life. There are chapters devoted to her husband and son, but it was mostly though Eileen's eyes that we experienced their lives. Despite the large page count, the pages move swiftly--it isn't dense and wordy. The prose is lean and assured, and the characterizations were supple and organic. There were a few times that I felt the story editing could go a bit smoother, as far as which events were captured and which were not. Periodically, I felt I had missed something, and realized it was just that some events that happened offstage were referred to only later, and it came out slightly unnatural. There were also a few anachronisms, like "Oh, snap," said by a character in the 1990s. However, these are minor irritants, and although it may have removed me from the novel for a few seconds, it didn't have severe consequences. I may try to come back to this later, but I should note that it has taken me nearly a month to read the first 200 pages of this novel -- when I normally go through 2-3 books a week. Honestly? I think it's very well written, I'm just bored. I don't think I'm qualified to declare this book a "Great American Novel," so I'll just call it a Great American Story... one whose quiet power I will long remember. Who'd a thunk it? I won this as a result of entering a Goodreads giveaway. I am a lucky First Reads winner! This is the story of an Irish American girl from New York named Eileen Tumulty, who, because of her less-than-ideal family situation, is forced to care for her parents and grow up too fast. She falls for an odd but endearing scientist named Ed Leary, and they are soon married Who'd a thunk it? I won this as a result of entering a Goodreads giveaway. I am a lucky First Reads winner! This is the story of an Irish American girl from New York named Eileen Tumulty, who, because of her less-than-ideal family situation, is forced to care for her parents and grow up too fast. She falls for an odd but endearing scientist named Ed Leary, and they are soon married with a child named Connell. Eileen sets out to make a good life for herself in spite of the fact that her husband does not always react to life's challenges the way she expects or hopes. When she discovers the reason for this, things take a very unexpected turn. ARC through NetGalley. Thank you NetGalley! First I should say this is a very long read. Some parts of this story held my interest, while others left me indifferent. It is often written in the third person, as such, this story is mostly told rather than felt. It begins in the 1950's childhood of our main character Eileen. Coming from a painful Irish immigrant background, Eileen wants more out of life. If fact, this is the main theme of the story. She is always looking for greener pastures, cares o ARC through NetGalley. Thank you NetGalley! It begins in the 1950's childhood of our main character Eileen. Coming from a painful Irish immigrant background, Eileen wants more out of life. If fact, this is the main theme of the story. She is always looking for greener pastures, cares only what others may think of her, and believes having more is what life is about. This is "The American Dream" which carries itself throughout this book. Eileen chooses a husband who is refined and sentimental. In doing so, she soon realizes that he miserly and content with his life as it is. While something is happening to her husband at a much deeper level, there is no attempt to understand, only a deeper drive for more. Eileen has trouble conceiving and even suffers a miscarriage, all the while being indignant and jealous of friends who can. When she finally conceives later in life, it is all about being the "perfect" family. The child himself grows up indifferent and as such is reluctant to help, even when he is desperately needed. 3.5 if I could give half stars. There are no perfect people in this book . I liked them one minute and didn't like them the next and then liked them again. That's pretty much how I felt about the book overall because for me it's really a character driven story rather than one that is driven by the plot. A lot of ground is covered here. The early part of the book is actually my favorite part, even though there are heartbreaking moments with 8 year old Eileen dealing with the problems of her Irish immigrant parents. Her mother is an alcoholic and her father, though well respected in the community is a gambler. At times, this part of the story reminded me a little of the quiet beautiful writing of Alice McDermott. Given her tough childhood, it makes perfect sense that Eileen wants bigger and better things in life – a bigger house, a more prestigious neighborhood – what she sees as a better life and you can’t fault her for those desires. She marries Ed, a scientist and professor and believes that together they will acquire the house and the better life that she envisions. Shortly after their marriage, Eileen becomes disillusioned with her marriage, as it becomes clear that she and Ed, no matter how much they love each other, do not want the same thing. My least favorite part of the book was the pages and pages of Eileen whining and plotting about how to get that better house. This is about more than just a house, though. It’s about ordinary people trying to live their day to day lives with their dreams, aspirations and daily burdens. Ultimately, it’s about these characters, Eileen, Ed, and their son Connell finding out who their real selves are in the face of devastating illness that changed everything in this family. Meticulous and ponderous, Matthew Thomas's debut novel, We Are Not Ourselves spans several decades, from a classic New York Irish immigrant story to the grinding tragedy of dementia and health care in the 21st century United States (at least prior to the Affordable Care Act). I've just lost a loved one to Alzheimer's and there is tremendous mercy to be realized in the relatively short span of time between diagnosis and death—only a few years and only in the final months was the decline as devast Meticulous and ponderous, Matthew Thomas's debut novel, We Are Not Ourselves spans several decades, from a classic New York Irish immigrant story to the grinding tragedy of dementia and health care in the 21st century United States (at least prior to the Affordable Care Act). I've just lost a loved one to Alzheimer's and there is tremendous mercy to be realized in the relatively short span of time between diagnosis and death—only a few years and only in the final months was the decline as devastating as what is portrayed in We Are Not Ourselves. Still, the descriptions of what patient and caregivers endure as the brain slips into the shadow of dementia are chilling, heartbreaking, and painfully familiar. Despite the connection to the themes, and many beautifully written passages, I struggled to connect with much of the narrative. It often read like a laundry list of events, rather than a story of flesh and heart. The relevance of Eileen Tumulty's childhood, her Irish immigrant parents, her mother's alcoholism, her father's conflicting public and private personas is lost as the decades roll on and Eileen becomes someone else entirely. That she is largely insufferable is not a detriment to the story-I have little patience for readers who have little patience for "unlikeable" characters-but the immigrant story seems to belong to a different book. What we can and must endure for those we love is deeply private and personal; Matthew Thomas shows us the terrible costs exacted by dementia: the tragic loss of money, time, memory, patience, energy, vitality, and hope. Oh sure, there are some quibbles. The opening 100 pages – the background information that fleshes out the characters – could be edited down a bit. A very minor character appears in the second half of the book and I had to wade back through pages to remind myself who she was. Another minor character’s part could easily have been written out. And so on. But in general, this is a page-turning novel that will easily appeal to both literary and mass readers because it’s so darn good. The focal character is Eileen Leary – wife, mother, nurse, and striver. Upwardly mobile, she marries Ed, a man who is, in many ways, her opposite: a reliably knowledgeable man who lacked the tolerance for superficial interaction, a scientist and professor. Together, they welcome a son, Connell, who becomes the center of their lives. But – to paraphrase George Bernard Shaw – men dream and the gods laugh and make other plans. The family is tested in an unforeseen way. Each of them must strive to figure out what’s important and what’s authentic in a life where the future is shady and the rules have been turned upside-down. This is a book that poses questions that each of us have mulled over in our minds. How do we claim our own lives and live by our own inner radar…as opposed to what we THINK we want? What makes a life worth livable? How do we survive when the odds are long? What endures when little else remains? Matthew Thomas creates an authenticity in this story and breathes life into his characters. Without giving anything away, the epilogue is beautifully written and encapsulates the book’s meaning and purpose. My best guess is that We Are Not Ourselves will be leading the best-seller list when autumn comes around. 4.75. This is as close to perfect as you're going to get, not just from a debut novel, but from any novel, period. There's such great heart in here. Primarily, the story focuses on Eileen Leary, a tough-as-nails nurse originally from Woodside, Queens, but each member of the family—Big Mike, Eileen's father; Ed, her husband; and Connell, her son—gets his due. You feel irretrievably drawn to all of them, so that every heartbreak, either minor or major, becomes your heartbreak and grips you long after yo This is as close to perfect as you're going to get, not just from a debut novel, but from any novel, period. There's such great heart in here. Primarily, the story focuses on Eileen Leary, a tough-as-nails nurse originally from Woodside, Queens, but each member of the family—Big Mike, Eileen's father; Ed, her husband; and Connell, her son—gets his due. You feel irretrievably drawn to all of them, so that every heartbreak, either minor or major, becomes your heartbreak and grips you long after you've put the book down, whether it's at the end of the first chapter or the last. (I am not ashamed to admit that this book had me in tears several times during rush hour on the Long Island Railroad.) Thomas pulls no punches. Each character endures his or her share of failure and suffering, but redemption is always close by, either in the form of fatherly advice on a pilgrimage to Cooperstown, or in the day-to-day selfless tasks Eileen must perform for her husband in the face of tragic illness. “Polished prose” (The New York Times), “epic of small events” (Los Angeles Times) and “extraordinary portrait of Alzheimer’s disease” (The Guardian). I would have to agree with this last comment about the depiction of Alzheimer’s but not with most of the praise given to this first novel. Reviewers have said it took Thomas ten years to write this book. I have to admire his tenacity but find it off-putting that he manages to lose the reader at certain points. The character of Virginia is a good example. It took me a while to remember that she was the woman Eileen met once, thirty years earlier in a store’s dressing room. Now living in her desired upscale neighborhood, Eileen is determined to have Virginia be aware of her improved economic status. So, after their first and only meeting thirty years earlier Eileen drives to Virginia’s house to confront her. Really? On the positive side, reviewers have hailed the author’s depiction of Alzheimer’s disease. My criticism of this part of the novel is the fact that while Eileen is a highly trained and experienced nurse, she doesn’t recognize the need for her husband to wear a medical alert bracelet, even after he has deteriorated dramatically and she has allowed him to walk to town where he disrupts traffic. It is only when Ed’s disease reaches the ultimate point of disorientation that Eileen finally yields. I muddled through to the end of the book knowing that my personal opinion is at odds with those of many critics. I think that additional editing might have made me somewhat more satisfied. WE ARE NOT OURSELVES by Matthew Thomas is a novel that starts off with a bang – the murder of a frog and a father abusing his son for it. Unfortunately, the bang fizzles quickly. The opening scene was something this reader wants to know more about – who the boy and the father are, for example. This reader is disappointed. Thomas moves swiftly from the frog and the abuse to the small daughter of Irish immigrants to New York City. There is no little boy in sight. Eileen Tumulty is interesting enough WE ARE NOT OURSELVES by Matthew Thomas is a novel that starts off with a bang – the murder of a frog and a father abusing his son for it. Unfortunately, the bang fizzles quickly. The opening scene was something this reader wants to know more about – who the boy and the father are, for example. This reader is disappointed. Eileen Tumulty is interesting enough for a while. Not for long, but for a while. She grows from a wide-eyed girl ready to conquer the world to a jaded young woman in a very short span of time. Her father dotes on her and her mother mostly ignores her. There’s a boarder in their house who plays the clarinet and he’s interesting but he disappears almost as fast as the boy and the frog. As girl children of immigrants, and girl children in general, are wont to do, Eileen marries a man she figures she must love. It’s a very odd sort of love, to be honest. Mostly, Eileen and Ed are ships passing in the night. The night being, of course, when Thomas makes the point again and again that marital relations are just fine in bed. When they have a son after years of trying and failing, everything starts to crumble. This seems due in part to Ed’s total disinterest in family and marriage and the constantly evolving racism that grows in Eileen. She is absolutely convinced that she is not racist but anyone who reads this book will see that she is. And she really could do something about it. But she doesn’t. All this happened in a quarter of the book. I stopped reading when my Kindle told me I was at 25% and I realized I no longer particularly cared what happened to these people. I’m still a little curious about the boy who murdered the frog, but I’m not that curious. I didn’t get those things. I’m sure someone else will. Spectacular. I cried through the last third, and I'm not much of a crier. And I found myself constantly astounded that this is a first novel. Six hundred pages and none of it wasted. I wasn't sure what I expected when I started this, but I loved, loved. loved this book. Thomas tells a real story, of every day people, sometimes not likable people, sad people who are living a real life. His characters are so gritty. Overachievers, quiet men, confused children...all struggling to fit together. The story follows a family as they grow apart and back together. There is tragedy and strength in this story and I will say there were parts I cried through. His characters and their li I wasn't sure what I expected when I started this, but I loved, loved. loved this book. His characters and their lives touched me, more that a book has in quite some time. This is not an epic family saga, a huge dramatic display. It is a quiet story, of love, of ambition, of loss, of acceptance, of growing older and wiser. Raw emotion-that is what I felt reading We Are Not Ourselves. This debut work is about a family…not the wider world or the major events of the more than six decades it covers, just a family. Not even an extraordinary family, just a typical American family with so many dreams and aspirations-some of which will be accomplished, but many more will be rationalized or compromised away. This book will leave you thinking deeply about your own life, your family and your place in the world. Stunning bea Raw emotion-that is what I felt reading We Are Not Ourselves. This debut work is about a family…not the wider world or the major events of the more than six decades it covers, just a family. Not even an extraordinary family, just a typical American family with so many dreams and aspirations-some of which will be accomplished, but many more will be rationalized or compromised away. This book will leave you thinking deeply about your own life, your family and your place in the world. Stunning beautiful prose and the characters were so vibrant-I LOVED IT!!! What a long, slow, tedious journey this was! This book is a great case for “less is more.” None of the characters were all that interesting and became less and less interesting as the book droned on and on and on. The narrative was often meaningless. Characters are introduced for no apparent reason and then just dropped, never to reappear. Hints of deceit are made and then forgotten. I had had enough by page 450 and finally bailed out due to terminal boredom. I really just didn't care any longer What a long, slow, tedious journey this was! This book is a great case for “less is more.” None of the characters were all that interesting and became less and less interesting as the book droned on and on and on. The narrative was often meaningless. Characters are introduced for no apparent reason and then just dropped, never to reappear. Hints of deceit are made and then forgotten. I had had enough by page 450 and finally bailed out due to terminal boredom. I really just didn't care any longer. "There are things you feel that you can't explain," Ed said. "You know other people won't understand them." One of those books that are so well done it seems beyond words to express how it makes you feel. I loved every part of this, even the slow parts... the parts that broke my heart, and even the stretches when not much happened. Eileen, Ed, and Connell are good people but with their own flaws. They go through life doing the best they can, even when life throws things at them they didn't expect "There are things you feel that you can't explain," Ed said. "You know other people won't understand them." Eileen, Ed, and Connell are good people but with their own flaws. They go through life doing the best they can, even when life throws things at them they didn't expect. Some decisions and behavior of each of them you don't always agree with but it rings true at the same time and you understand the reasons/motivations for it. Sometimes Eileen would get on my nerves. I knew she wanted more from life but now and then I wished she would have appreciated the life she did have more. It warmed my heart though to see her and Ed together. Their marriage wasn't perfect but it was a solid, loving relationship. When a certain event happened, I was proud of them for how they handled it and pushed through. Words are failing me a bit here, which in its own way is a high compliment to the author. This is an elegant, sometimes haunting book and it gets you thinking quite a bit. Would highly recommend, specially the reading guide at the end. “We Are Not Ourselves”, by Matthew Thomas, was recommended to me by a close reading friend who warned me that this novel is a “slow boil” and I wouldn’t realize what all the fuss was about until I’d been into it for a while. But I have to confess, I never did get to the point that I understood why there had been a bidding war in the publishing world over it. For me, it’s reasonably entertaining and interesting, but by no means magnificent. It tells the story of Eileen Leary and her “absentminded “We Are Not Ourselves”, by Matthew Thomas, was recommended to me by a close reading friend who warned me that this novel is a “slow boil” and I wouldn’t realize what all the fuss was about until I’d been into it for a while. But I have to confess, I never did get to the point that I understood why there had been a bidding war in the publishing world over it. For me, it’s reasonably entertaining and interesting, but by no means magnificent. It tells the story of Eileen Leary and her “absentminded professor” husband Ed, and their son Connell. I tried to think of adjectives to describe Eileen, who is the main protagonist and a nurse by profession, such as: cold, shrewd, xenophobic…but while those attributes can be defended, they don’t paint the full picture; Eileen is also fiercely loyal, loving, self-doubting and pragmatic. I was often frustrated with Eileen. She cares so deeply about what others (even strangers) think of her that it often negatively determines her course of action or inaction. She becomes paralyzed by fear of reaction and several times in the narrative fails to act when necessary (example early on in a choking scene). I was also easily frustrated by Connell, who also seemed to lack a force of will unless it was to make the inappropriate choice. BUT, it’s unfair to be too critical of Eileen and Connell having never experienced the challenges that these two characters are forced to bear. Ultimately “We Are not Ourselves” (title hint: think of Nancy Reagan’s whisper to Ronnie: “We are doing all we can.”) is about the heartbreaking difficulty in letting go of our imagined future or a view of ourselves. I suspect most of us, having reached a certain age, have had to “recalibrate” what we hoped and planned our life would be into what we must accept it is. Although I think the novel has been over-hyped, I never considered stopping reading – it definitely holds one’s interest – but it could have benefited from tighter editing, in my opinion. Points for keeping me reading it even though at first I wasn't too interested. Still....the flow kept pulling me. But it came into its own about a third of the way in, as the real story began to emerge. Alzheimer's has such an insidious onset that it is hard to recognise at first. It gathers strength and becomes progressively disruptive of the mind, the personality, and the family. This was exceptionally well described and touching. And the letter toward the end squeezed a sob out, so bumped up f Points for keeping me reading it even though at first I wasn't too interested. Still....the flow kept pulling me. But it came into its own about a third of the way in, as the real story began to emerge. Alzheimer's has such an insidious onset that it is hard to recognise at first. It gathers strength and becomes progressively disruptive of the mind, the personality, and the family. This was exceptionally well described and touching. And the letter toward the end squeezed a sob out, so bumped up for that too. Disclaimer: My sincere thanks to NetGalley and Simon and Schuster for providing me with a complimentary e-book copy of this book in exchange for my honest review. My Review: Lately I've been on a search to find a great sweeping saga of a read - one that spans a couple of generations and has a lot of drama. So when I read the description of this book on NetGalley it seemed to fit the bill perfectly. This book was described as 'epic in scope' so I suppose I was expecting much more of a intergenerati Disclaimer: My sincere thanks to NetGalley and Simon and Schuster for providing me with a complimentary e-book copy of this book in exchange for my honest review. This book was described as 'epic in scope' so I suppose I was expecting much more of a intergenerational family saga with lots of energy, familial turmoil, engaging storylines and characters that I could root for. Unfortunately, this book wasn't what I expected and I had a hard time staying interested. I admit that certain scenes were touching but overall the book felt excessively long and lagged most of the way. I think We Are Not Ourselves focuses so much attention on character development and relationships that the plot and energy waned and got bogged down in small, daily life details. It didn't help that Eileen wasn't a character that I clicked with at all. She comes off as self-centred and always on the hunt for the 'things' that will make her happy. She was extremely superficial and I didn't connect with her at all. I'm still not exactly sure why Eileen's xenophobia was brought into the storyline either. It didn't seem to give me a better insight into her and made me like her even less than I already did. Towards the end of this book I was still holding out hope that the author would divulge some big, monumental secret. Some family skeletons that were going to turn things around and give this book some oomph. Unfortunately that big reveal never came. I will say that I found this book, at times, quite touching and emotional due to personal connections that I have with one of the major issues in this book. I truly wanted to like this book (and my feelings are in the minority with many other reviewers). But while I found this book to be well written unfortunately it was just too slow moving and I wasn't fond of the characters or its unrelenting melancholy. There were times in the early stages of reading this book that I was certain it would only get 3 stars from me. It wasn't badly written, but not beautifully written. It felt at times as though chunks of the story were missing or skipped over, and story characters were a little confusing in their thoughts and actions. Not the kind of writing I wanted to devote 600 pages to, but it was for a book club assignment, so I needed to persevere. But then Eileen, her husband Ed, and their son Connell are d There were times in the early stages of reading this book that I was certain it would only get 3 stars from me. It wasn't badly written, but not beautifully written. It felt at times as though chunks of the story were missing or skipped over, and story characters were a little confusing in their thoughts and actions. Not the kind of writing I wanted to devote 600 pages to, but it was for a book club assignment, so I needed to persevere. But then Eileen, her husband Ed, and their son Connell are dealt a blow from life, and their efforts to cope with this thing are so achingly rendered by this author that my heart broke into pieces. They are good people, hard-working people trying to live the American Dream. But life happens, and the dream has to take a backseat to reality, or as one character states, "their former future life. The ghost of the life they almost had."